An employment summary based on the U.S. Bureau of Labor Statistics’ (BLS) December 2015 monthly jobs report. The U.S. economy added 211,000 jobs in November, beating Wall Street’s projection of 200,000 new jobs for the month, according to BLS. The unemployment rate remains unchanged at 5 percent, which makes it more likely that the Federal Reserve will raise interest rates later this month. The government also revised employment gains for October and September to show net gains of 35,000. 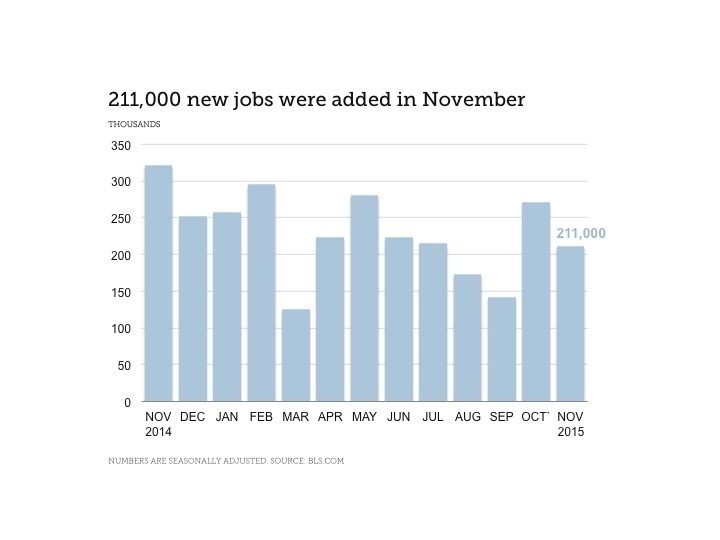 October’s data, initially recorded at 271,000 jobs, were revised to 298,000. September’s count was revised to 145,000 from 137,000 jobs. However, the civilian labor force participation rate, at 62.5 percent, remains at historic lows—numbers not seen since the late 1970s. That means nearly 95 million Americans are currently not employed. For the third straight quarter, U.S. CEOs expressed caution about the economy. The Business Roundtable CEO Economic Outlook Index also finds that 27 percent of CEOs want to decrease capital spending over the next six months. The survey involves many of the chief executives of leading U.S. companies. Hiring plans remained consistent, but the plans to lower capital investments is the biggest anticipated reduction since 2009. This week, BLS announced that labor productivity is on pace for 2.2 percent annual growth while wage increases is on pace for 4 percent annual growth. The Federal Reserve is considering the first rate increase since June 2006. The Open Market committee will hold its last meeting of the year in mid-December, and Feds chairwoman Janet L. Yellen has consistently argued that the economy can support higher interest rates. “The data indicate a steady improvement in the labor market that should support the Fed’s confidence that now is the right time to hike rates,” said Thomas Costerg, senior U.S. economist at Standard Chartered Bank in New York. But a rate increase could cause challenges for the U.S. public sector as the federal and state governments face the prospect of higher borrowing costs and larger interest payments on debt obligations. Executive job seekers are more likely to see opportunities in sectors such as healthcare, professional services, information technology, retail, food and drink, construction, accounting and finance. However, managers and executives will need to acquire new skills to keep up with the times. Most employers are looking to innovation and disruptive business practices to help them remain competitive in their respective industries. More than ever, employers have more tools to find top talent. With Baby Boomers heading for retirement at a rate of 10,000 per day, recruiters will need to consistently fill their talent pipelines. To see the latest salary figures, download our free 2016 Salary Guide.